After two month of releasing Google Chrome stable 8, Google Chrome development team has continued to upgrade the stable version of Google Chrome to 9. 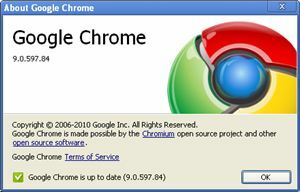 The latest stable version of Google Chrome 9 has been improved with several features, stability and bug fixes. WebGL – brings plugin-free 3D to the web, right inside the browser. Chrome Instant – web pages that frequently visit will begin loading as soon as start typing the URL. Chrome Web Store – Added a link to the Chrome Web Store on the New Tab page with two sample apps. (Currently, only open to all Chrome users in the United States).